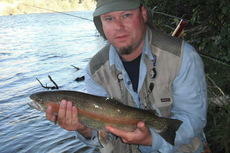 Nate was born and raised on the Salmon River in Central Idaho. At a very young age, he started casting gray hackle flies at rainbows in White Bird Creek. Nate remembers to this day the 14-inch fish that jumped completely out of the water with his fly hook in his mouth. Nate has been chasing fish and making dry flies since that moment. Every time a feeding group of fish refused to take his offering, he studied the bug that he didn't have and tied him in detail. For over 40 years Nate has put a footprint along the shores of high-mountain lakes, spring creeks and tail waters that have all led to the creation of Dry Fly Innovations.There is nothing that would thrill him more than you tying on one of DFI's flies and having the fishing day of your life. It's DFI's goal and passion to share the excitement of our fishing adventures through our videos and to provide you a quality fly hook that creates a little "Fish Magic." We all at DFI hope to always hear your voice rising from the river saying, "There He Is!" Geoff was born and raised in Idaho and continues to live in the Treasure Valley. He attended the College of the Redwoods in Eureka, CA where he played baseball and graduated with high honors (Phi Theta Kappa), and received two AA degrees (Social Science, College Studies). Geoff moved on to Northwest Nazarene University on a baseball scholarship and graduated in 2005 with a Business Administration degree. 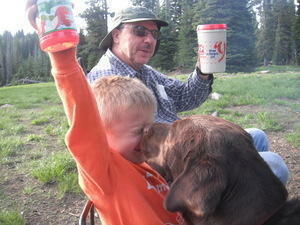 All his life his father has been there to show him how to thoroughly enjoy the outdoors. From hunting big game, following chukars, catching crappies, and hunting ducks and geese, the most enjoyable art he was ever taught was to fly fish. He has been fly fishing since he was 7. Geoff and his father share a passion when they hit the water to see who can out fish whom, and hates it when Dad out fishes him and he never hears the end of it! Geoff has never had so much success with flies as he has had with the flies that Dry Fly Innovations produces. The quality, strength, and durability are like nothing else. He claims he has yet to wear one out, but admits to losing a few in trees and fishes' mouths. 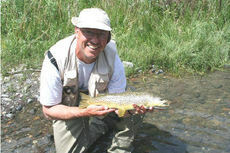 His dream is to see his fellow fly fishing enthusiasts on the waters using DFI flies and hearing them say "There he is!" Nathan was born and raised in Idaho. Most people travel to the valleys of heartache or endure the eye of life’s tempest before they can emerge with songs that grip the human experience; but Nathan Brumley went hiking. Following high school, he spent his formative years as a contractor building recreational trails to high mountain lakes and fishing parks in the heart of the Rocky Mountains of Idaho. Shorlty after finishing his last season of trailbuilding, he won Embassy Music’s national songwriting contest in 2000 which subsequently led to his move from Boise, ID to the music mecca of the south, Nashville, TN. He’s previously had 2 publishing deals with Embassy Music and Brandon Hills Publishing and has completed his 5th full length album. 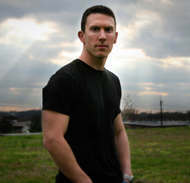 He is currently the second place winner in the USA Songwriting Competition and was voted best 14 acts of the Southeast by Discmakers 2007.His music is clearly remindful of piano banging crooners like David Gray, Ben Folds Five, and Gavin Degraw.In addition to that, Nathan is a writer for the Songs Of Love Organization which writes customized songs for kids with terminal illneses. He has had 3 songs picked up by Warner Brothers Telepictures Music and was the artist of the month with them in March 2009-also the same month that he had a hold with “Grey’s Anatomy.” Nathan was also a second place winner in the 2009 USA Songwriting Competition, is on a rock compilation ablum called “The Next Big Thing In Rock”, and was rated #17 in the college market in 2009 for his album “Where You Move Me.” He has also been featured on Nashville’s Lightning 100 new artist spotlight in July 2009. His film placements include: Life Unexpected, Ugly Betty, and Palisades Pool Party.Currently he’s had a hold with Vampire Diaries which is still pending, song placement with Billy Ray Cyrus’s Surprise Homecoming, 3 songs picked up by MTV, and was chosen to be on a mix CD called “Get In The Mix” which is came out in late 2011. He also just recently just got placement in a new Nickelodeon series called "Hollywood Heights". Nathan and his wife Melanie live in Nashville with their two young sons. His music is used exclusively in DFI's videos. 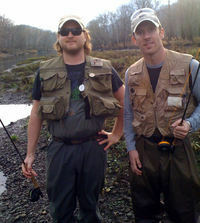 Introducing Brent Hendrich and Nathan Brumley of Nashville, Tennessee. They are the production crew for all of the music on our videos and website. Brent does all the final mixes; Nathan composes, arranges, and plays all the music scores. Mudd finally found a friend!